Please note that starting January 2020 there will be slight adaptions of the itinerary. For further information contact us! Arrival in Buenos Aires and transfer to the hotel. In the afternoon visit of Palermo with its beautiful parks and artificial lakes and the trendiest neighbourhoods in Buenos Aires: Palermo Soho & Palermo Hollywood. Half day city tour in Buenos Aires to visit the main sights with a stop at the famous Café Tortoni, the oldest literati café of the city. Enjoy a cup of coffee & snack. During the excursion you can opt between a tango lesson with specialized teachers or a wine tasting session of different Argentinean wines. Optional: Tour to the Tigre and Delta of the Parana River OR A day at the countryside visiting estancia Santa Susana OR San Telmo Antique Fair tour (all excursions on shared basis). Transfer to the airport and flight to Iguassu. Upon arrival in Iguassu pick-up at the airport and transfer to the Argentinean National Park towards the Argentinean side of the falls. After visit transfer to the hotel on the Brazilian side of the falls. Visit of the Brazilian side of the falls. Afternoon is at leisure for own activities. 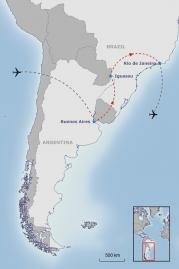 Transfer to the airport and flight to Rio de Janeiro. Transfer to the hotel. Full day city tour including visit of the Sugar loaf mountain and the Corcovado. Transfer to the airport and return flight or post-tour. "Hotel in Rio de Janeiro"